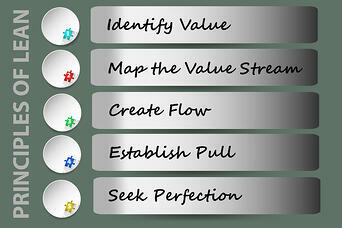 The concept of Lean is very straightforward; eliminate or reduce waste in a process. These principles have been applied across manufacturing, but are often overlooked or simply not understood in marketing. The sales cycle/process has evolved from a benefits/features model- look what I have for you- to a customer-driven model- what do you have for me? Further, the role of the salesperson has evolved dramatically in most market sectors. Spending time knocking on doors and making cold calls via phone have become dinosaur methods of selling. Modern selling methods indicate that you need to allow a customer to buy from you and that you eliminate any steps that complicate that process- Lean Marketing. One highly effective tool that eliminates waste in the sales process is Predictive Lead Scoring. Predictive Lead Scoring is a data-driven method based on behaviors, demographics and engagement. How can you use Predictive Lead Scoring as a Lean Tool for Marketing? Sales and Marketing teams have evolved to agree on what is considered a Marketing Qualified Lead and what is considered a Sales Qualified Lead. This resolves the age old conflicts of, "We send leads to sales and they don't close them," and, "Marketing sends us bad leads." Sales is now able to spend time on the leads that are qualified and marketing is able to spend time generating content to engage and move qualified leads through the sales process. As you gather more data, you can add weight to each piece of criteria, thus improving lead scoring and refining your model. Quality 101: Plan, Do, Check, Act. If you are using the HubSpot Enterprise platform, below are five ways Predictive Lead Scoring can improve your marketing efforts. One of the benefits of using Predictive Lead Scoring in marketing is how it will improve your relationship with your sales team. Your sales team wants as many leads as possible, but they do not want to spend timing calling leads who will never turn into customers. Once you implement Predictive Lead Scoring, you will not need to send leads to sales until they are more likely to purchase. You can immediately send them the leads with high lead scores but wait on the medium or lower lead scores until they have been nurtured further and may be more likely to purchase. Not only is it a more effective use of sales' time, but it will help you, as the marketer, segment your database for any marketing campaigns you plan to run. You can also run a report to see who owns the most qualified leads in your database and if there are any you should re-assign. If you have one sales rep who follows up and closes qualified leads, that's a good sign that he or she should be given these leads. If you have another sales rep who doesn't follow up with the leads who have been identified as qualified, it may be time to reassign that person's leads to someone else. If someone falls into the top 10% of your database and has a high lead score, it is important that your sales team knows right away. Set up a workflow to send an internal email notification to the sales rep who owns each lead with a high predictive lead score. You can let them know what the lead score is and even show them in the Predictive Lead Scoring App what information was taken into account to make them a good fit for your company. Your sales team will then be able to take immediate action with this group of highly qualified leads. Not everyone will initially have a high lead score. This is when lead nurturing comes into play. Take a look at the positive attributes that make up your predictive lead score. If you see a piece of content that was viewed or a marketing channel that you used for the promotion, that may be something that you can use in a nurturing campaign. For example, if you see that one of your positive attributes is viewing a certain piece of content or viewing at least five pages on your website, you know that you have to get that piece of content in front of your contacts that do not have high lead scores and/or get them to view more pages on your website. Each contact's Predictive Lead Score will be shown in their contact record. This also means that you can create lists based on Predictive Lead Scores. Build out a list based on the medium or low Predictive Lead Scores. Use the Email App or Workflow App to communicate with them about the piece of content you know is more likely to convert leads. The piece of content example is just one way you can nurture them. Take a look at these attributes and try to think of ways you can get your contacts to take the actions that would increase their Predictive Lead Score. As they take these actions, their lead score will update. If they cross over into the high lead score category, you can send them directly to sales. Besides nurturing emails, you can also set up social monitoring streams to interact with your contacts. Create streams based on contacts who fall into the low and medium lead score categories. Utilize social media to try to get them to take an action that you know will increase their lead score. For example, if you see them talking about a certain topic or conversation and can fit a helpful piece of content into the conversation, do that. Or simply interact with them, ask them questions, answer their questions or generally be helpful. Because your Predictive Lead Score is a Contact Property, you can build reports to analyze your Predictive Lead Scores. Use the Contacts Report, broken down by Predictive Lead Score, to see how your contacts are growing over time. Note how many contacts are falling into the different categories and adjust your marketing tactics for those in lower-scoring groups. You can also create a list of contacts with the highest lead scores and run an Attribution Report to view the most valuable content they have interacted with before converting to a customer. Remember, since your Predictive Lead Score is a Contact Property, you can get creative with your reporting. As with any Measurement System Analysis, the key to successful Predictive Lead Scoring is accurate and meaningful data. 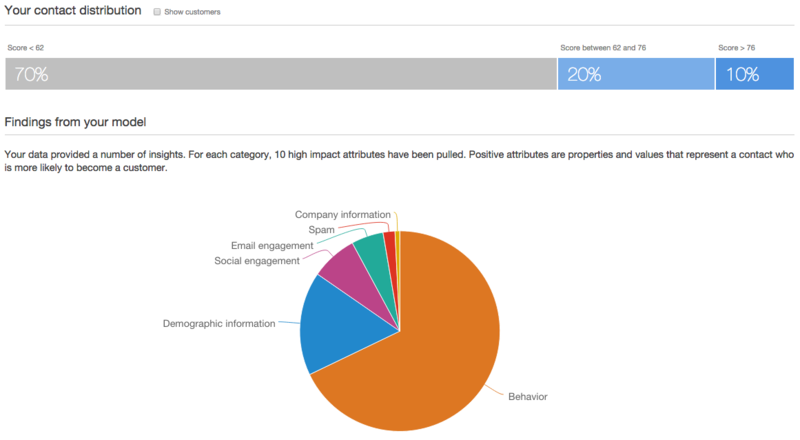 Look back at current customer activities and engagements to find common behaviors. If every one of them downloaded a certain piece of content, then it makes sense to add weight to that content in your customized Predictive Lead Scoring process. You might be feeling a bit overwhelmed or not sure exactly where to start at this point. Check out our page Marketing For Manufacturers.